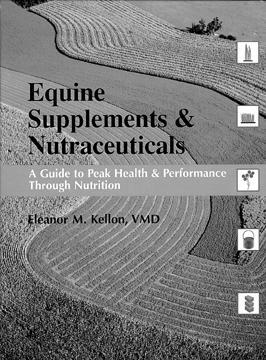 In this easy-to-read volume, Dr. Kellon presents her recommendations for improving the athletic performance of horses and solving some of their health problems through nutritional supplements. Kellon points out that most diets given to horses, even what appear to be well-balanced diets, lack important nutriments. Kellon says supplying these nutriments through combinations of supplements can make a world of difference to the animal. Performance Enhancement The book includes many easily followed color-coded charts which present Kellon's formulas for improving equestrian speed, endurance and agility. Baseball stars are not the only athletes who can benefit from creatine and other naturally occurring performance enhancers, Kellon reports. The author suggests 17 supplement programs that use ingredients from DMG to branched chain amino acids and selenium. The programs offer the promise of better performance in horse sports of all kinds from high-energy sports like racing and endurance to low- and moderate-energy sports like jumping and dressage. Alternative to Traditional Medicine Other charts present supplement programs for relieving many common equine health problems including arthritis, skin & hoof conditions, digestive difficulties, reproductive and respiratory problems. In each case a nutritional program is recommended, usually including appropriate supplements. Buyer's Guide Small fortunes can be spent on nutritional supplements for horses. Kellon points out that much of this expenditure can be avoided by buying shrewdly. A buyer's guide offers money-saving advice on finding and buying the right supplements at the right price. Graphics Make a Difference Nutrition books usually confound the reader with eye-blurring charts filled with little numbers. Kellon's book presents its information through easily read color-coded graphic that put the doctors' recommendations at the reader's fingertips. Dr. Kellon is an established best-selling author. She has also written Dr. Kellon's Guide to First Aid for Horses, Equine Drugs and Vaccines and The Older Horse. In this, her latest work, she makes some dramatic claims for the effectiveness of a good supplement program.